WeWork, the $20 billion valued coworking space provider popular with startups, is one of a handful of launch customers for Amazon's Alexa for Business product, an enterprise grade version of its popular voice assistant product. It is initially piloting the device internally and developing Alexa 'skills' - standalone applications and integrations with backend systems - to allow members to control meeting room facilities, check if a room is free and even request analytics to be read out. During his AWS re:Invent keynote last month Amazon CTO Werner Vogels promised that with Alexa for Business you will no longer need to type in a conference ID as Alexa knows which room you are in. So in theory you can simply say "Alexa, start the meeting" - Alexa will then turn on the video conferencing equipment, dial into your conference call, and get the meeting going. WeWork started three months ago by piloting the system in its New York headquarters in Chelsea, by putting the small Alexa-powered 'hockey puck' shaped Echo Dot devices in meeting rooms. Speaking to Computerworld UK from New York, Josh Emig, head of product research at WeWork said: "The Dot was the easiest, lowest barrier to entry to get this rolled out." "So we can buy a bunch of Echo Dots and put them in meeting rooms with a reasonably low level of effort to get this networked interface up and running." 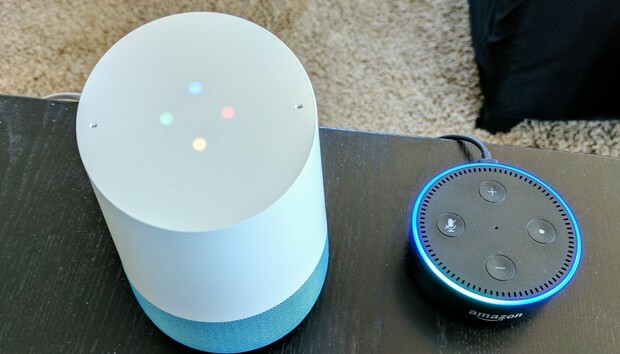 Emig believes that despite voice technology being relatively ubiquitous now, Alexa stands out from rivals like Google Assistant and Apple's Siri because Amazon have taken the time to adapt it to a work environment, where it isn't tied to an individual profile. "The reason it is more enterprise ready is [Amazon] provide a way to manage multiple devices in a work setting, with logic to provision them and how they are mapped spatially into our systems, which might exist elsewhere, but doesn't exist at this kind of level," he said. He added: "The original product was meant to be tied to individual identities, so adapting that to a business environment opens up the door and puts them ahead in that regard." The overall aim for WeWork, according to Emig, is to "use technology to remove friction in the workplace" for its 175,00 tenants, which it calls members. In a WeWork blog post Alan Jackson, director of systems research said "the Alexa for Business technology is easy to use and designed to be developer friendly", adding that it took his team just a couple of weeks to set up the basic interface. For meeting room bookings, lights and temperature this required a custom integration into WeWork's proprietary room booking system. For equipment issues there is a direct integration with Zendesk to file facilities tickets automatically. Other SaaS vendors like Salesforce, ServiceNow and Splunk, as well as conferencing software like Zoom and Twine have pre-built Alexa Skills. WeWork is taking a fairly cautious approach to the rollout of Alexa for Business though. "I think we will continue to develop upon the Alexa platform for ourselves to really understand the real value it brings and understand how people respond to it and how it changes people's behaviours and improves their experience. "So we have a lot of work to do in that regard and it is not just a matter of taking the tech and building a couple of skills and rolling it across the world, because we have 200 locations and 175,000 members. So we are aggressive and ambitious about getting the tech out there, but there are a lot of people that is affecting." WeWork will now move to pilot the technology internally at some regional HQs, including London, and then to enterprise members through its white label office technology service Powered by We. "The next step is to understands how it works in different places with different people and cultures and understand how we manage the distributed network of devices across the world," Emig said. "I don't think that precludes us from pushing it to selected member locations when we reach the point where we feel like we have the skills developed. We will take some time to get that right as these technologies are delightful when they work, but when they don't, they are very frustrating."